Common garden insects such as cabbage worms and other caterpillars, aphids (plant lice) and so forth, can cause considerable damage unless timely and efficient control measures are employed. 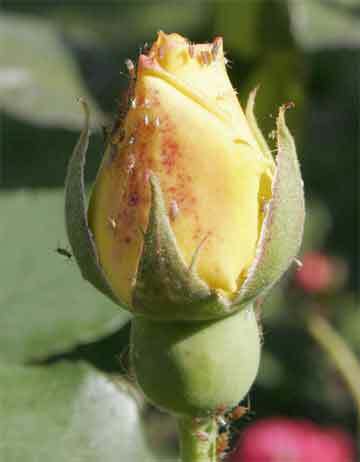 Similarly, plant diseases such as black spot, the bane of rose growers, mildew and various other diseases cause defoliation and serious loss of plant vigor if uncontrolled. When a home gardener is buying a product for use against insects or diseases, it is important to fully understand what the individual component or components of the product will do. For example, common garden insecticides such as malathion and Sevin, will only control insects. They are useless against fungus diseases. Conversely, common garden fungicides such as Captan will only control diseases and are useless against insects. Some products contain both a plant fungicide and insecticides, and these will control both insects and diseases as stated on the label. It is, therefore, important when buying a pesticide product that you check the pesticide label carefully to determine whether the specific uses for the product will fulfill your needs. After buying a pesticide product, it is equally important to use it correctly, and this can only be done by Reading the Entire Directions and Caution Statements Carefully Before Use.